On Friday, Oct. 10, Phi Theta Kappa International Honor Society inducted 48 new members into the Alpha Omicron Omicron Chapter at Mid Michigan Community College. To join the honor society, students must have a 3.5 Grade Point Average or higher and have completed at least 12 credit hours at MMCC. 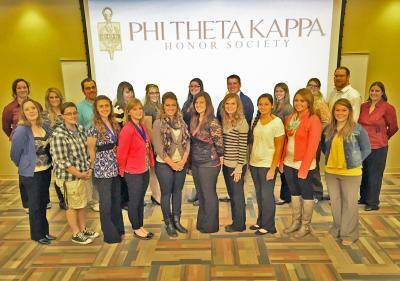 Phi Theta Kappa International Honor Society encourages the academic achievements of two-year college students and provides opportunities for individual growth and development through honors, leadership, and service programming. Today, Phi Theta Kappa is the largest honor society in American higher education with more than 2 million members and 1,275 chapters throughout the world. Chartered on April 18, 1989, MMCC’s chapter has a longstanding tradition of excellence. For the past seven years, Alpha Omicron Omicron (AOO) has obtained the highest achievement level for a chapter—5 Star status. Through its activities, the chapter meaningfully serves the college and community. AOO is a friendly, active, community-oriented chapter. PHOTO: Front row (L-R) and (Major): Danielle Kohler (Graphic Design), Margini Schafer (Health Sciences), Makayla McQuiston (Psychology), Rachel Brown (Therapeutic Recreation),Haley Hensley (Elementary Education), Ashlee Hobbs (Nursing), Christina Isaac (Accounting), Sydney Hubbard (Biology), Shayann Richardson (Diagnostic Medical Sonography), Chelsea Jeske (Physical Therapy Assistant). Back row (L-R) and (Major): Rebekah Averill (Nuclear Engineering), Cassie LaBonville (Business), Brian Tice (Computer Information Systems Networking), Heather Garno (Nursing), Alexandria Lobert (Nursing), Whitney Smith (General Studies), Michael McLoughlin (Nursing), Megan Williams (Athletic Training), Gabrielle Dangler (Undecided) Aaron Bauman (Economics and Statistics), Katie Larson (Nursing). Not pictured: Mohammed Almorae, Nicole Beltinck-Burden, Mark Clark, Danielle Collins, Nicole Cuthbertson, Derek Franke, Eric Gregory, Brittany Haton, Daniel Jacobs, Quincy Jones, Brenna Kind, Brittany Leatherman, Steven Marshall, Lindsay Martin, Angela Moyer, Jessica Ostrander, Kyler Parker, Kendra Robison, Candice Roestel, Kennedy Shea, Lizette Shirely, Mason Smeznik, Jessica Soltysiak, Christina Stewart, Shandel Veddler, Devin Warner, Lindsey Zielinski.